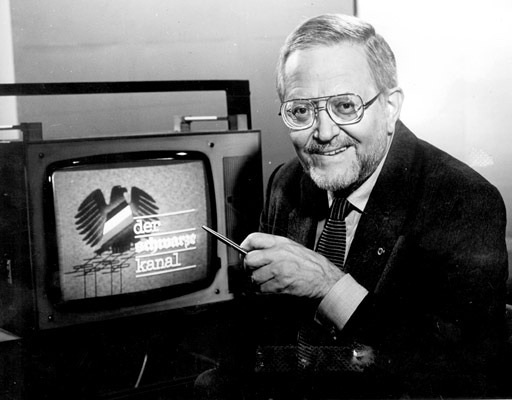 Der Schwarze Kanal, an East German propoganda programme which ran from 1960 until the fall of the Berlin Wall in 1989 was devised and hosted by the fiercely loyal GDR/DDR party member, Karl-Eduard Von Schnitzler. The twenty minute programme which aired every Monday evening featured clips of Western programmes over which Von Schnitzler would spew anti-imperialistic sentiments designed to scare the watching public into believing the Mielke-led dictatorship was their only hope of democracy. He was the archytyple commited communist. Drafted into the German Wehrmacht at the begining of World War Two he was captured by the British at Normandy in 1944 where they used his talents in the Ministry of Information and the BBC. By the end of the war he had moved to the British controlled zone in Hamburg and later Cologne where he worked for the local radio station. No sooner had he risen to the post of Head of Politics did his political ideaology become so apparent that his eventual dismissal was inevitable. By the start of the 1950s Von Schnitzler was firmly esconsed in the East German sector working on radio programmes for Rundfunk der DDR. He was keen to lose the grandeur of his surname by dropping the ‘von’ but Walter Ulbricht would have none of it, for him it meant a sign that even the upper classes were finding the GDR doctrine more acceptable that the West’s. Nick-named ‘Sudel-Ede’ or ‘Filthy Ed’ he became famous for his very selective editing of newspaper reels from the West and the kind of commentary one can imagine from a communist dictatorship. In the final years of his life he remained staunchly anti-imperialist, admitting that he whilst he had long ago realised the economic fragilities socialism brought and the lies they told their people his focus was entirely on anti-imperialsim and that alone was the central thrust of ‘The Black Channel’. He died of pneumonia in 2001. For a fascinating interview with Von Schnitzler and a unique look at East Germany and the personal accounts of some of its citizens one should look no further than Anna Funder’s remarkable book ‘Stasiland’. In his final public address Von Schnitzler offered no apology declaring instead that ‘revisionism was still amongst the people and the class struggle would continue’. It would seem given my own experience of early post Wall reunification in 1991/92 that he had a point. The ‘Ossies’ would find the road to acceptance in the West a long one and many remain on it to this day.